At a cold and misty Dijon-Prenois circuit yesterday (Thursday), Romain Brandela and Thierry Stepec had their first taste of their Creation Lister Storm – entered in the 2006 FFSA GT Championship. 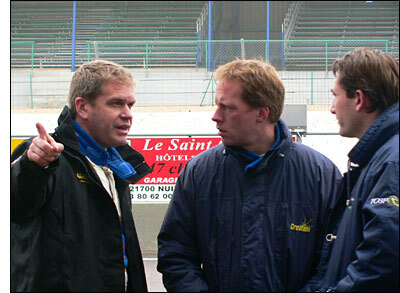 The Frenchmen completed nearly 100 laps of the circuit and declared the test 'a success'. Creation's Lister GT1 specialist Jamie Campbell-Walter was on-hand to help the drivers acclimatise to their new toy – before heading to Paul Ricard to test the Creation hybrid. "I think the drivers acquitted themselves very well. 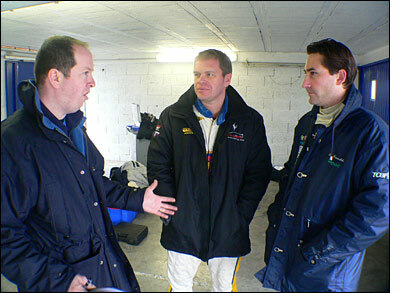 The car didn't miss a beat all day, and I believe they learned a lot in readiness for their first race," commented JC-W. In the other image, Brandela and Stepec look just as confused with what Creation’s Ian Smith is saying as JC-W does with the words of the two Frenchmen. “The drivers I believe will make a good, equal pairing,” says Creation’s Andy Woolgar. “I think they are capable of gaining some great results this year." 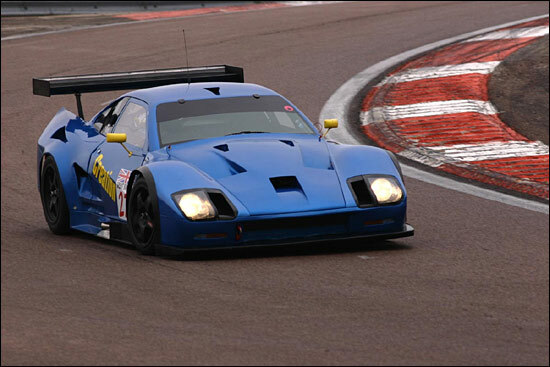 The opening race of the FFSA GT series is in three weeks’ time, at Nogaro.